Use the guide below for selecting your replacement collets. The best way to tell what type of collet you is to measure the length of the collet. ER, TG, and SYOZ collets all have unique length and diameter measurements. 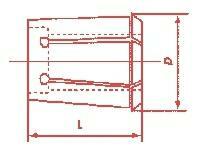 The dimensions below will help determine Tool Holder Collet Type.